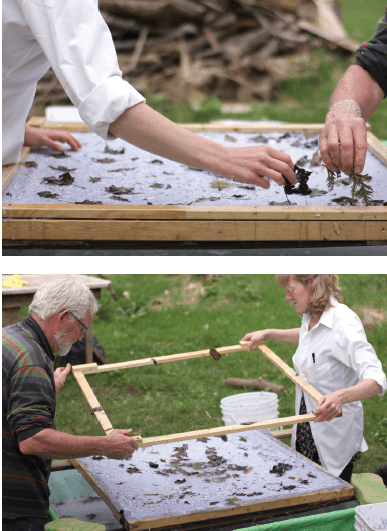 In spring 2014, the ReMediate project brought together artist Christina Kingsbury, writer Anna Bowen, and non-profit Pollination Guelph, to make a 305 square metre quilt for the decommissioned Eastview Landfill in Guelph, Ont. Embedded with native seeds Kingsbury collected, the quilt was made from recycled paper and plant material. 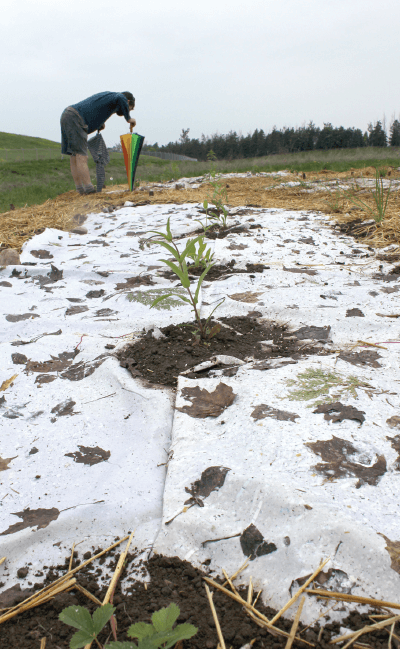 Sewn together entirely on site, the quilt is now in the process of biodegrading, taking root, and becoming a living habitat for threatened pollinators, such as native solitary and ground nesting bees, bumble bees, butterflies, and other indigenous species. Pollinators account for plant reproduction and are responsible for an estimated one out of three bites of food people eat. Devastatingly, however, there is a widespread global decline in pollinator diversity due to habitat loss, pesticide exposure, and climate change. The Eastview Landfill site was historically wetland, and in parts, farmland. In use from 1961-2003, the site is now capped with clay and harvested for methane. 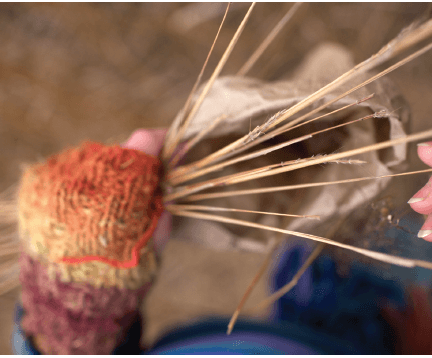 Through research and interviews with professionals and citizens who held memories and information about the site, Bowen and Kingsbury documented fragments of its natural and waste history. The interviews informed Bowen’s accompanying poetry, which tells the story of the layered history of the landfill site, the writer’s experience, and the making of the quilt. During the installation, as Kingsbury sewed, Bowen printed selections from her poetry onto the sewn quilt. 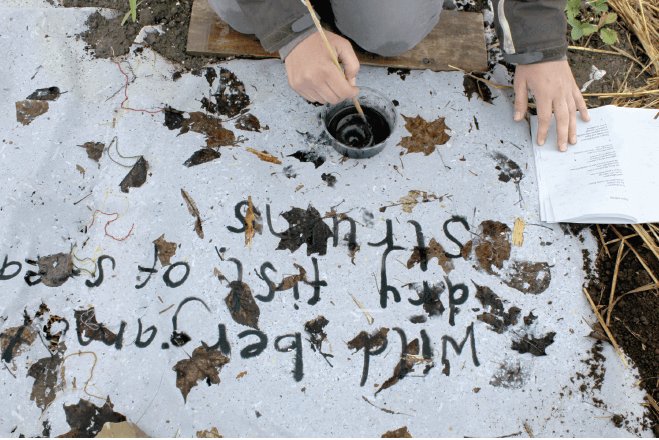 The public was invited to hear the poetry at audio listening stations on-site and to participate in the performative process of sewing and planting. A gesture of care that critiques the exploitation of land and labour inherent in a consumer culture, the ReMediate project makes many connections: between work that is devalued in our economic paradigm; the labour of bees and pollinators; the domestic labour of women; and the low-wage labour of outsourced workers. Its creation embodies an intimacy that moves beyond commodification and nurtures different possibilities for relating with ecology. —I heard it was the neighbour.